Dorsey Earnest only had one cow with horns, and one day, it was his bad luck to be standing behind her when she bucked up and drove a horn through his left eye. 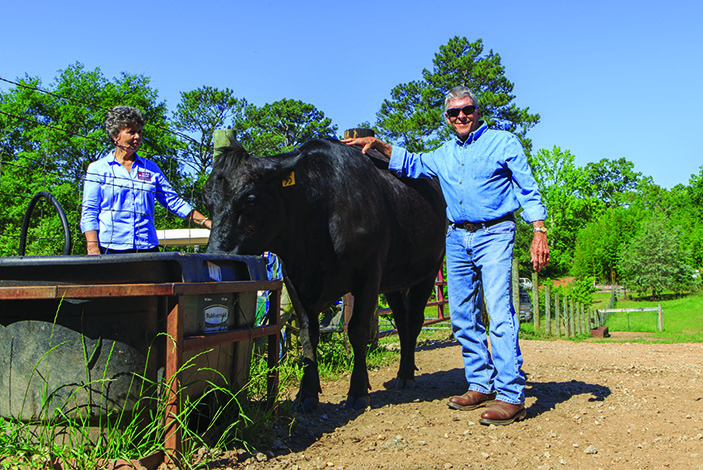 Dorsey and Peggie Earnest at home on their Palmetto, GA, farm. When Earnest first came to Emory Eye Center, he was in so much pain he nearly begged the doctor to remove his left eye. Earnest has farmed and had cows and horses for 45 years. With the treatment of his left eye, he can now see across his pastures once more. Dorsey Earnest lost vision in his right eye almost twenty years ago after a fishing rod accident. 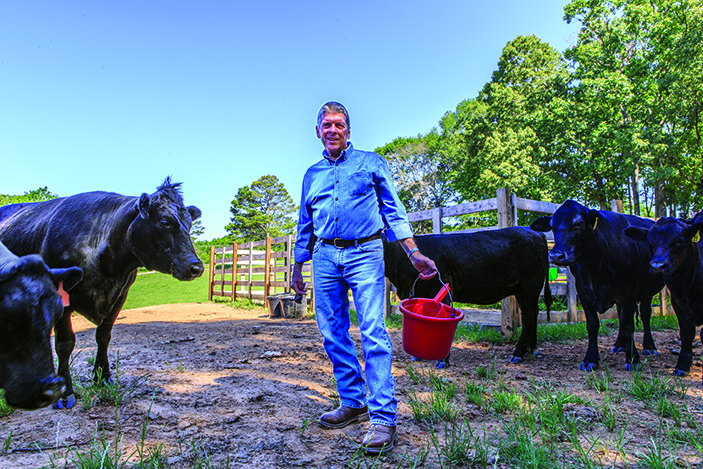 A few years later, another accident — caused by one of the cows on his farm — damaged his left eye and began a series of events he would never have imagined. "It was one of those things you never think would happen," Earnest says. 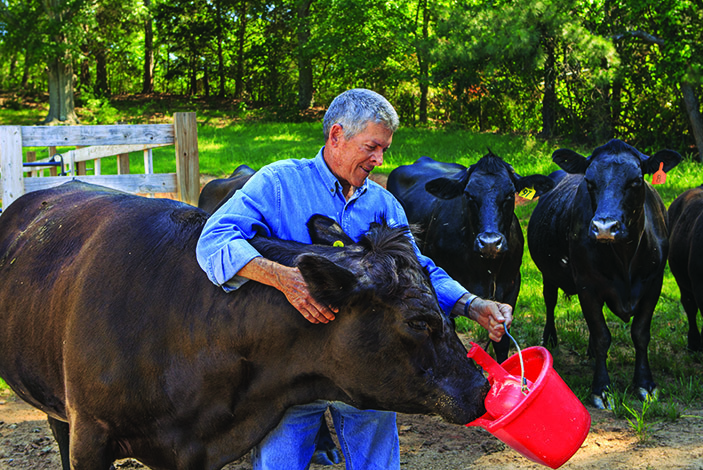 "I only had one cow with horns, and she was standing beside me at the feeding trough. Another cow startled her, she threw her head back, and one of those horns went in my left eye." Physicians were able to keep Earnest from losing his vision, but multiple problems ensued. "It never fully healed after the cow incident," he says. "I could still see, but that eye was always red and kept getting infected. It was very painful and just wasn't right." About three years after the accident, a physician discovered that Earnest's pain wasn't simply due to infection or lack of healing; he had cancer on his left eye. The diagnosis was conjunctival squamous cell carcinoma. "It started in the corner of my eye next to my nose, and grew almost to the iris," he says. "The doctor removed it and sewed in amniotic membrane to help it heal. He put me on chemo eye drops for a while afterwards. "I thought things were good," he says, "and then wouldn't you know it came back about a year and a half later?" Surgery removed the cancer again but brought constant pain for Earnest. "It felt like I had rocks grinding in my eye," he says. "I can't even begin to tell you how much pain I was in for years. It might let up for a few hours, but always came back. It was horrible." Despite living in Palmetto, GA, Earnest had been seeing an eye doctor on the north side of Atlanta for many years. He decided to find one closer to home, so switched to a new group. One of those physicians recommended he try a "bandage" contact lens to protect the cornea's surface. "I would wear the lens for 30 days and then replace it," Earnest says. "I had suffered for so many years, and this finally stopped the pain. The doctor said it helped keep scar tissue on my cornea from rubbing against the inside of my eyelid. I thought we'd found the answer." The bandage lens worked as planned for about eight months. Then the times between changes began to shorten, as the lens would start getting foggy before 30 days had passed. "I had to take the lens out after 20 days, then aft er 10, then after only two or three," he says. "At that point it would be so foggy that I couldn't see well enough to get it out. My granddaughter has trauma nurse training, so she helped with it sometimes. When she looked at it that last time, she saw something growing in my eye and onto the bandage lens." Earnest was referred to a different ophthalmologist, who said the cancer had returned. "He said he couldn't do anything about it, but he knew a great specialist — someone he thought was one of the best in the world — who could." That specialist was Jill Wells, MD, an ocular oncologist and comprehensive ophthalmologist at Emory Eye Center. The referring physician called to schedule an appointment with her while Earnest was still at his office. "He just kept saying, 'Please don't break this appointment. You have to see her,'" Earnest says. "I promised him I would go." As he waited the few days until his appointment with Wells, Earnest watched the cancer spread — quickly. "It grew much faster than it had before," he says. "It was about a quarter-inch wide and moving down from the top of my eye. By the time I saw her it had gone across the iris and covered the pupil. I was completely blind in that eye and in unbelievable pain." "When I first met Mr. Earnest, he nearly begged me to remove his eye," Wells says. "He told me he'd been suffering from severe pain in his left eye for years, and he didn't care if he lost his eye as long as the pain was gone. "I told him removing the eye was out of the question at that point in time," she continues. "Conjunctival squamous cell carcinomas can have a high rate of recurrence with surgery alone — up to 50%." Above: Cancer had spread across much of Dorsey Earnest’s eye when he firs came to Jill Wells, MD, for treatment. Below: Earnest's eye, cancer free after surgery. Wells mapped out a different plan of attack during his first appointment. "Any patient who comes to me with a recurrence gets the 'full court press' at the time of surgery to hopefully prevent another recurrence," she says. "I recommended surgical excision of the entire lesion with adjuvant cryotherapy, injection of interferon, and placement of an amniotic membrane." "She was determined to do whatever she could to get rid of the cancer and try to keep it from coming back," Earnest adds. "I knew that she meant it." About a week later, Earnest underwent surgery and the other steps Wells had outlined. Follow-up care included steroids, antibiotics, and interferon drops. Within days, his vision was better and he had no pain. "I saw him in clinic a couple of weeks later and was surprised to see his vision so drastically improved," Wells says. "Most important for him, the pain had dissipated." "When I came to Dr. Wells, my eye was horrible," he says. "It was red and raw and had this crusty, yellowish brown cancer growing. But now it's just as clear as can be. You can't tell any difference between my eyes." The best result from surgery was that Earnest regained full sight in his left eye and currently is cancer free. "I'll still watch him closely — every three months for the first year — to be sure this cancer doesn't recur," Wells says. "In the meantime, I'm thankful his pain is gone and he can see." "I know there's a chance it could come back someday," he says. "That's how cancer is. But after everything Dr. Wells did for me, I believe her when she says it's gone for now." Wells also gave Earnest something he'll never take for granted again: the views of his farm. 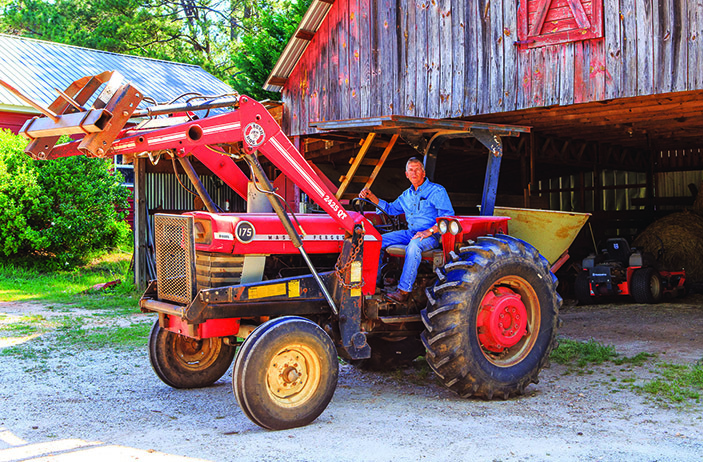 "I've farmed and had cows and horses for 45 years," he says. "To be able to look across my pastures and see everything there, that's just the best thing of all. Dr. Wells is a miracle worker in my book."